We have been enjoying a charmed tour, managing to stay several days ahead of any undesirable weather. During the past 24 hours we watch the radar and see that the area we left yesterday had major rain. Everything stays clear for us, but we do have to deal with some early morning fog. 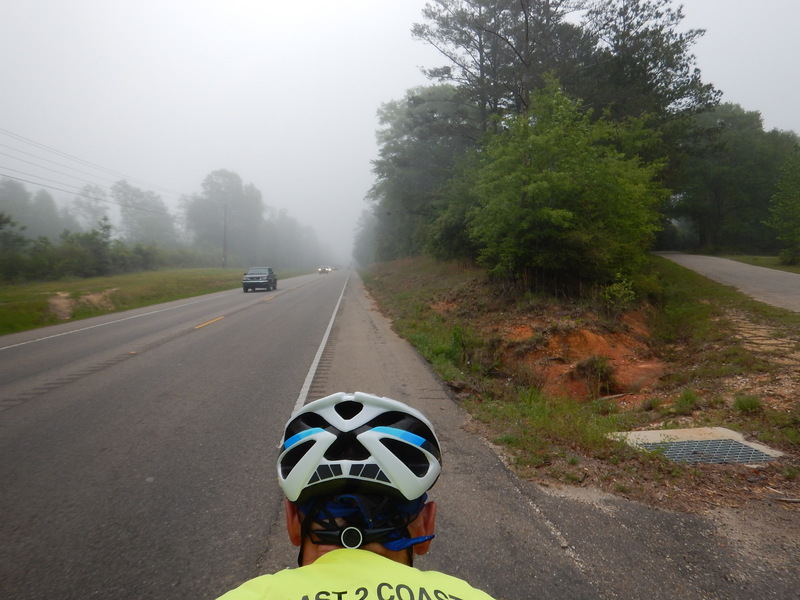 At 8:30 AM, it’s still somewhat foggy, but we have very bright lights on our front and rear and we finally get out on the road. Our time in Louisiana is drawing to a close. We won’t miss the crappy roads (our friends Linda and Eric call it “Lousy-Anna”), but the food is great and the drivers are much nicer than in Texas. 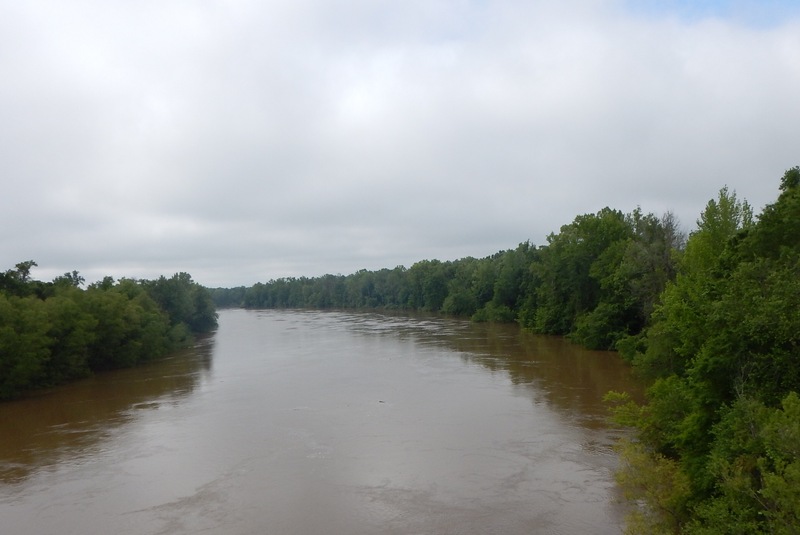 We cross a very flooded Pearl River, which is the state boundary. 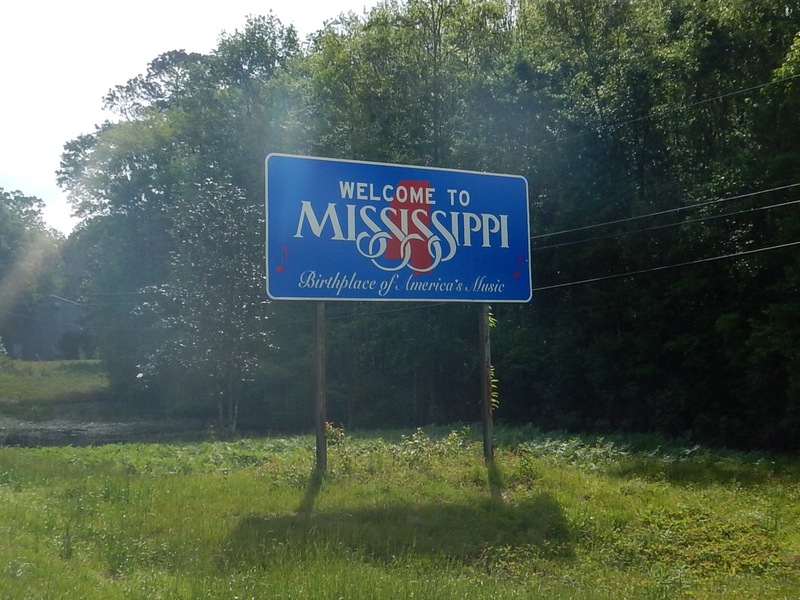 Then we enter Mississippi (our sixth state!) with a pretty unimpressive sign. What, no welcome? A mile later we are officially welcomed into the state. No bullet holes are in the sign. The start and end of this route are hilly. We’re happy it’s a short ride. The roads aren’t much better here. 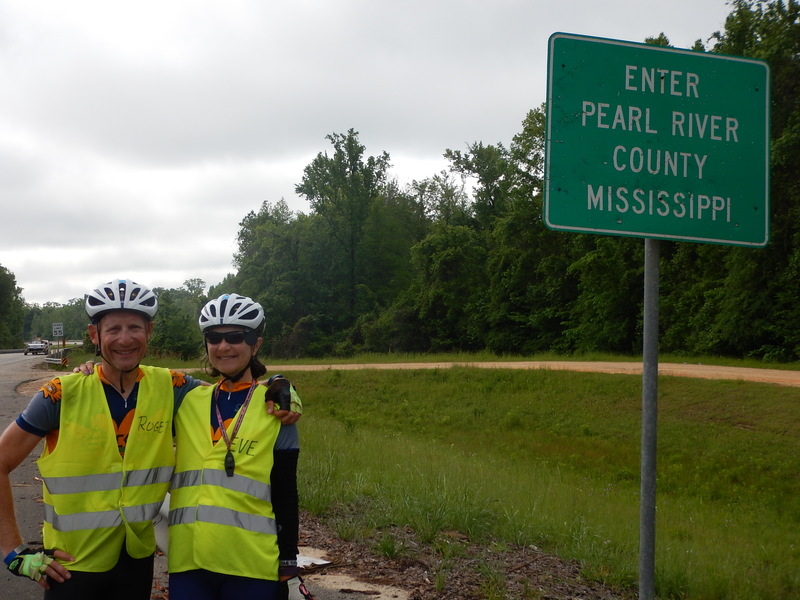 Our reward comes after lunch in Poplarville (the blueberry capital of Mississippi). Blue Bell ice cream two days in a row… life is good! 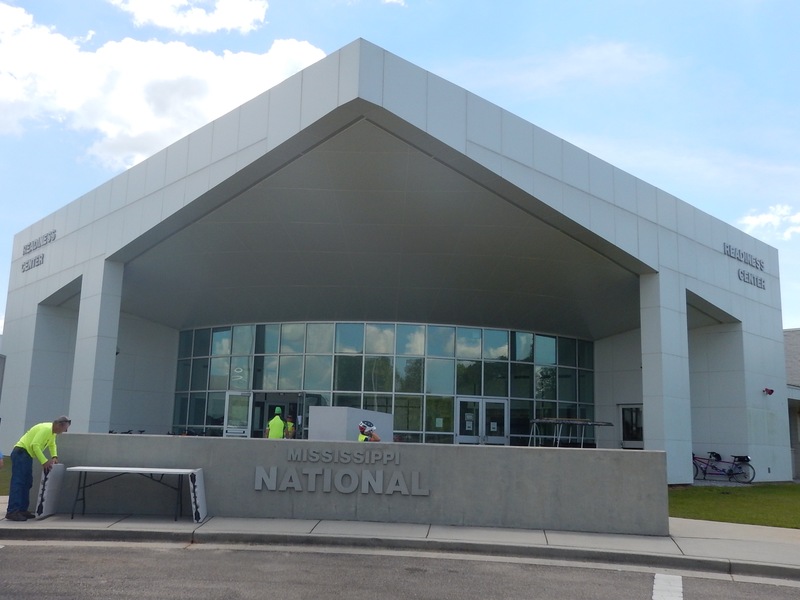 We are staying at a National Guard Armory this evening, indoor camping at its finest… a beautiful new, clean building. This building replaced one that was destroyed by Hurricane Katrina in 2005. Once again we thank the American taxpayers! Tomorrow: we come within spitting distance of the Gulf of Mexico. Eve, it looks like you are the queen of ice cream, with that crown “on” your head. Glad you only had fog today. 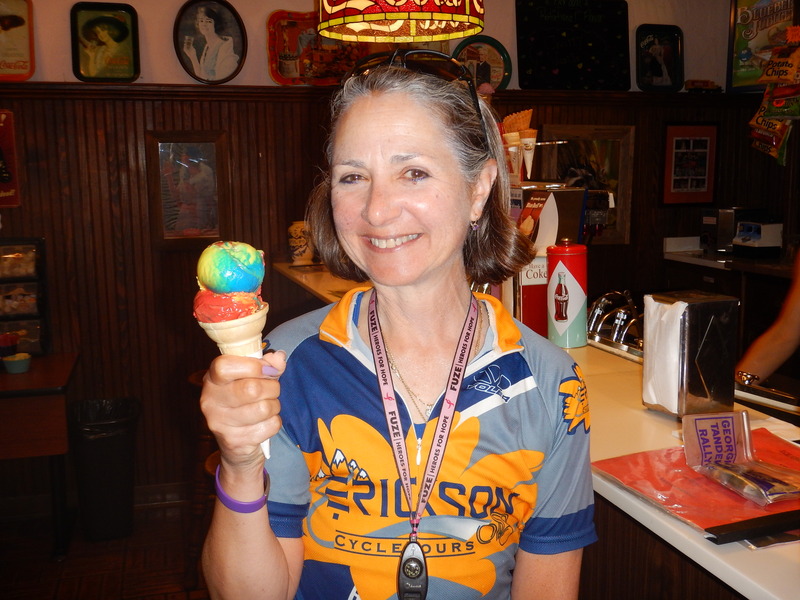 Being a Blue Bell ice cream junkie……..try the new Ice Cream Cone flavor. The BEST!! Hope you don’t experience any ghosts. When I checked your moving dot today, you were doing 0 mph on the state line between LA and MS, so I knew you were taking your picture. Continued good luck with the weather! Why thank-you Connie! Becky, the flavors have been very limited, but I’ll keep an eye out! I did a ride in LA in mid ’90s – I see they have done ZERO to improve them! Am so enjoying following your adventure – truly admirable and fun for us! – FL: These roads are perfect too.